To bridge the gap between need and resources in the Alberta rescue community by providing financial and volunteer resources, thereby allowing these charities to expand their impact on the community and helping more animals in need. Our Annual Gala is one of our most important fundraising events of the year. It is a spectacular evening where we get to thank our current supporters and meet those of you who are not familiar with Four Feet and our commitment to helping animals in need. 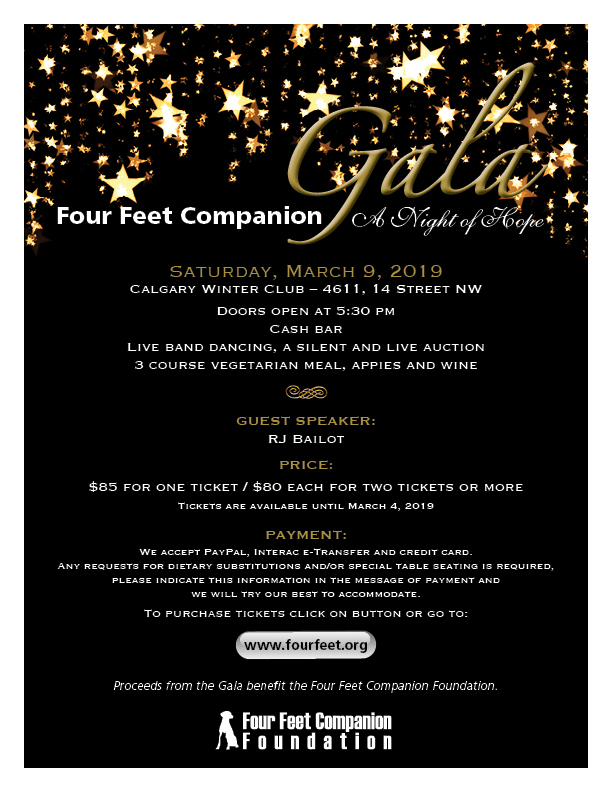 The event is being held at the Calgary Winter Club on Saturday March 9, 2019. It is sure to be an amazing evening, complete with live music, dancing, live and silent auction items and a three course vegetarian meal. We also have special guest speaker, RJ Bailot. Tickets are $85.00 for one or $80 if you purchase more than one. You can click on the handy link below if you would like to pay by paypal. We also accept E-transfer or credit card! When paying , please indicate any seating or dietary requests in the message of the payment. We hope to see you there and once again, thank you for your ongoing support!